Fans of piper betel, rejoice! It survived the freeze somewhat well. Robert Barnum told me that the lower leaves got burned by the cold, but the ones higher up survived. Piper betel is a shrubby, branching, leafy vine that climbs as high as the treetops. Robert has to climb up a tall ladder to harvest it from the higher levels. The piper also spreads from tree to tree like ground cover. It appears not to damage the tree it’s on at all, just uses it as a support. 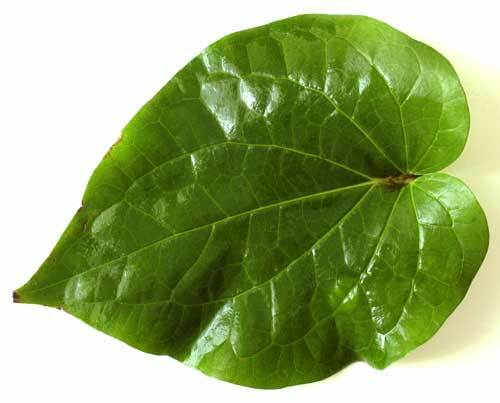 Piper betel is a member of the black pepper family, and is used usually as an outer wrapper, or cooked or steamed. Frodnesor at Food For Thought used it successfully as a wrapper for a Vietnamese dish a few weeks ago. Bill at Tinkering With Dinner combined it in a stir fry with lemongrass and sugar, and got a taste of root beer. Fascinating! But don’t try it raw. La Diva Cucina discovered that the hard way when she put it in a salad a few weeks ago. Cooked is so much better, darling! Robert advises to use piper where you want a smoky, sausagey flavor. He uses it in various ways — as a layer in lasagna, cooked with greens, or blanched first to use as a wrap for sushi rolls. He also created a recipe where he dips the piper betel leaf into tempura batter and fries it. 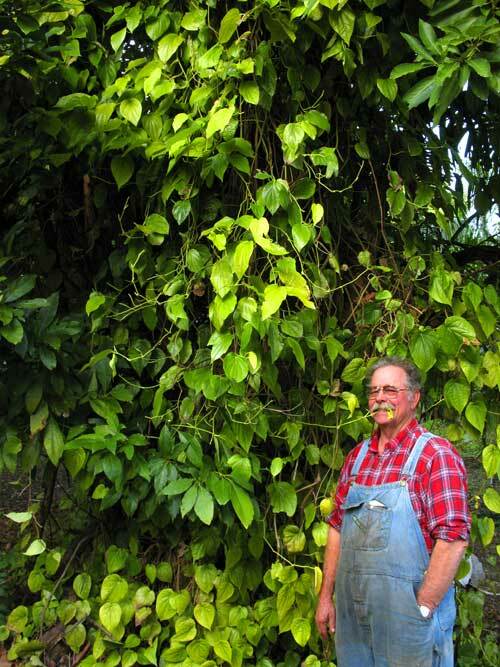 Robert Barnum stands in front of a tree covered by piper betel. Picture taken before the last freeze. ARGH! That betel leaf is my nemesis! But I shall conquer, YES, and I WILL subdue your strong medicine flavors….just you wait Little Betel Leaf!! I have every confidence in your ability to tame the feisty piper betel! It will kill the trees, same as air potato, kudzu and all the rest of the invasive vines. They don’t drain the sap, they just block the sun. And become heavy mats that act like a sail in a wind-storm, bringing down the weakened tree. I hope those vines don’t escape into natural areas! I think it would work really well with chipotle. That’s the tack I’m going to take next time I get hold of some. You raise a good point. I’ll ask Robert about that and let you all know. The air potato, ugh, what a pest. Helped gather up pounds of those during the last stroll through his grove. Yum, that does sound like a good idea! If you can’t wait to get more, I think it’s available (most of the time) at the Redland Organics tent at the Pinecrest Gardens Farmers Market on Sunday mornings. Bill, STOP getting inside my head!! When Marian said to think of smoky uses of the betel leaf, that was the first thing I thought of….I wonder if the chipotle would complement or compete?